The greater Cape Town area in South Africa wears many hats. All are equally beautiful in as much as they are different. From wild coastal shores of white sand to rolling vineyards of lush green, desolate dusty oranges of the interior and vibrant colours of the inner city. This eclectic mix of urban, suburban and countryside living within an hour’s driving radius offers travellers a feast of unique sensations and experiences. The Dunstone Collection is a portfolio of three properties spanning across winelands, beach and city, that provides a continuity in style and service to enhance your overall guest experience. The Collection is a splattering of sea air along the West Coast, an unparalleled vineyard vista in the Cape Winelands and a stylish urban escape in the heart of Cape Town’s trendy De Waterkant district. Situated on a family-run boutique wine farm, the flagship of the Dunstone Collection is Dunstone Country Estate, which offers a host of stylish and elegantly furnished 4 and 5* accommodation. Both self-catering and B&B options are available and each self-catering property has a private swimming pool, providing guests complete privacy and independence during their stay. Additional touches in the guest rooms include luxury cotton linen and bathrobes, daily room servicing, flat screen TV and complimentary Wifi. A mobile spa service is available for those looking to indulge in further R&R in the comfort of their own room. All overnight visitors are invited to daily tea and cake each afternoon in the guesthouse lounge area; this rolls into free wine hour and nibbles at sunset, giving you a chance to sample the Dunstone wine underneath a sensational sky overlooking the backdrop of the dramatic Hawequa Mountains. What to do during your stay: guided or self-guided wine tasting tour of the Wellington Wine Route, a 4×4 nature safari, horse riding through the vineyards, scenic mountain biking and trail running, or simply chill out poolside at Dunstone Estate with book in hand! The coastal element of the Dunstone Collection is a uniquely positioned beachfront property in the sleepy fishing village of Jakobsbaai (Jacob’s Bay) along the West Coast of South Africa. 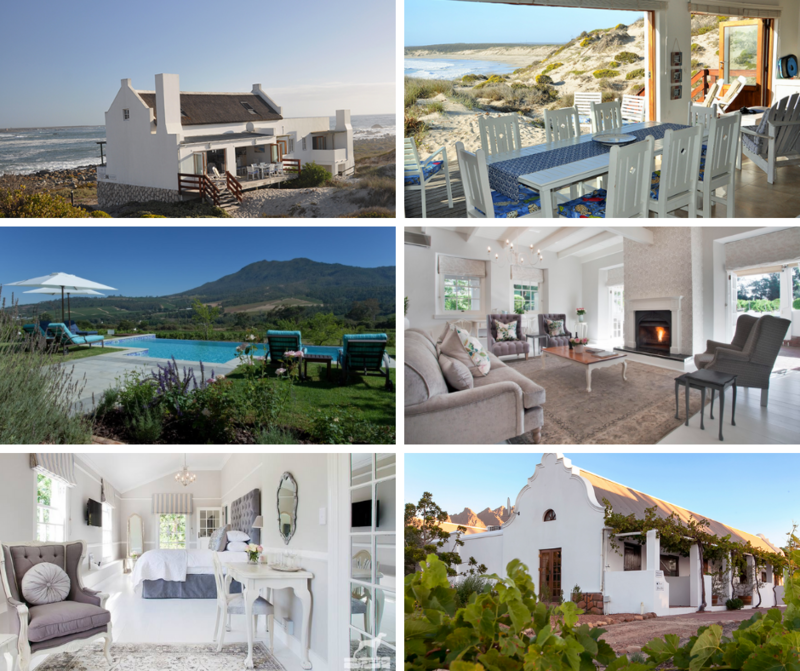 Dunstone Beach House is situated just 50m from the water’s edge of a long, sandy white beach and sleeps up to 8 adults comfortably. With fully equipped kitchen, dining and lounge areas, this self-catering property is suitable for both nuclear family getaways or larger, more festive celebrations with extended family or friends. Beautiful sea and nature views from every room make it a home for all seasons and the quiet and serenity of its position offer a true escape from the noise and stresses of city living and the chance to completely unwind and renew. What to do during your stay: long, uninterrupted beach walks, swimming and bodysurfing in the waves of the Atlantic, fishing and diving for crayfish and mussels (permits required), or just relax on the private deck of Dunstone Beach House with a glass of wine! De Waterkant Cottage is the newest addition to the Dunstone Collection and is the perfect option for a getaway to Cape Town city. Nestled on the lower slopes of Signal Hill in a popular, vibrant and historic residential area, it is a stone’s throw from the renowned V&A Waterfront and within walking distance to many trendy restaurants, bars and sidewalk cafés. A fully equipped one-bedroom property, De Waterkant Cottage sleeps two adults comfortably and can accommodate infants free of charge. Stylishly furnished, it has a private patio with outdoor BBQ grill for Summer dining and a private rooftop deck; ideal for morning coffee or sundowner wine! What to do during your stay: Hike up Table Mountain, visit Robben Island by ferry from the V&A Waterfront, get in some beach time at Camps Bay or Clifton followed by sundowners on your private rooftop deck at De Waterkant Cottage.